Giant (1956), directed by George Stevens and based on the Edna Ferber novel set in Texas, is another of Tiomkin’s large-scale scores. Using full orchestra and choir against the opening credits, he wastes no time in presenting an expansive musical statement. Rock Hudson and Elizabeth Taylor play husband and wife, while a moody ranch hand played by James Dean completes the emotional love triangle. Tiomkin provided a recurring love theme to aid the amorous relationships, to which Paul Francis Webster added lyrics for the song ‘There’ll never be anyone else but you’. 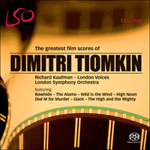 Tiomkin wrote more than two hours of music for Giant. ‘I sat in a projection room for nine hours’, said the composer, ‘watching herds of cattle crossing the screen, cows going from left to right, cows going from right to left’. Tiomkin’s wife jokingly quipped that the director ‘is waiting to see a cow wink at the camera’. Giant received ten Academy Award nominations, including direction and music. Stevens was the film’s sole Oscar winner, but Tiomkin could take consolation that his scoring fee was the highest to date for a Hollywood composer.